Jesus is still moving towards His final destination. They are approaching Jerusalem. Jesus has prophecy to fulfill so He sends His disciples off on and errand. Jesus was coming into Jerusalem fulfilling the full prophecy. He was righteous. He was victorious in all His encounters with the religious leaders and was fast approaching His ultimate victory ground. He was lowly and humble in all He did. Now He just needed the donkey to complete the prophecy. Jesus knew EXACTLY where this donkey would be waiting. God had prepared it in advance. God’s preparations was the focus of our discussion when we looked at Matthew’s account of this event. That blog entry was entitled, “Jesus’ Entry Into Jerusalem.” Today I want to touch on the faith of the other people involved in this story. Three examples of faith in action stand out for me. The first is obviously Jesus’ disciples. They willingly went into the next village and carried out every word of Jesus’ instructions. They didn’t second guess where Jesus wanted them to look or what they were going to say. Jesus’ disciples had become accustomed to listening closely and obeying exactly what Jesus directed. 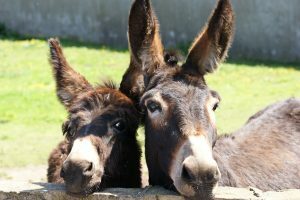 Mark tells us that when Jesus sent His disciples into town to get the donkey that they were given exactly what to say to anyone who challenged them. They were to say that “The Lord has need of it and will send it back here immediately” (verse 3). Our challengers had faith that Jesus would indeed return their donkeys. Jesus had never before, as far as we know, asked to borrow items from individuals. I’m willing to bet that they these people had heard the stories about Jesus, and decided to trust Him with their possessions based solely on the basis of His reputation and character. I believe Jesus returned the donkeys on His way out of Jerusalem that evening as they walked back to Bethany. The third example of faith in action comes from the crowd following Jesus. This huge group had faith that Jesus was their Messiah and had some plan to install Himself as King. They knew the danger getting behind a push for power could entail, but they willingly participated in ushering Jesus in with fanfare. They had faith that Jesus was going to Jerusalem for a final confrontation and that they would be safe, as long as they remained with Him. I don’t know if it was the Holy Spirit acting on the crowd that got them shouting praise or not. Somehow someone started the praise ceremony and everyone was swept up in it. I wonder if any of them had any idea they were fulfilling prophecy at the time. I wonder if the crowd crying “crucify Him” contained people from this crowd. I believe it did. I also think it might have been because they were disillusioned by the fact that Jesus hadn’t tried to seize control. Had they lost that faith they had earlier on? Father God, I am awed to see the impact simple everyday faith can have. Without it none of these events would have taken place. You placed the right people in the right places, and then counted on their faith in Your works to finish the job. I don’t know if You will ever use my faith to do such marvelous works, but if You do, I pray I won’t let You down. I pray I will live up the challenge You set before me. Again, Lord I believe, help my unbelief. Thank You for using us warts and all and also for growing our faith along the way. Extremely helpful information specifically the remaining section 🙂 I handle such info much. Thanks for visiting my site and for being a repeat visitor too. I appreciate your patronage. I trust God is able to speak something into your life during your visits. Please join in anytime. I love to hear what He is doing in other’s lives and how He is using what your find here. Thanks for visiting my blog. I appreciate your encouragement. I have a hosting company that created and manages my site, to my specifications. I appreciate their work and have gotten a lot of compliments on the look of it. I manage all the content, including the little bit of html coding required to make the blog posts look like I want them to. I pray the content speaks as loud as the format. Thanks for the comment and feel free to join in again anytime.